No more excuses! It's too hot outside. It's too cold. It's raining. I'm too busy. I'm too tired. Later, later, later! Believe me. I've heard them all and even ...used them all myself at one time or another. I have some info for you that could help. And you don't even have to spend money on a healthclub membership or expensive equipment that only tends to gather dust. You know what I'm talking about. I ordered that Ab cruncher from TV too. The American Heart Association is a reliable organization as far as I'm concerned. They've joined together with Exercise TV and Walk at Home creator Leslie Sansone to produce a series of videos. Start! Walking at Home is available three ways! FREE if you have ExerciseTV On Demand. Available to digital cable subscribers on demand at ExerciseTV, Category: Start Walking. Own the DVD! Purchase online at exercisetv.tv/startwalking. Download the workouts to your computer or portable device. Go to exercisetv.tv/startwalking. So, on this Fitness Friday why not make the choice to do something today to take care of your heart and your health? NO MORE EXCUSES! And while you're in a Fitness Friday mood, be sure to hop over to Sandy's God Speaks Today. Sandy is still on vacation at the beach (poor baby). But you won't be disappointed. She has a guest blogger and her Fitness Friday post is one you won't want to miss. Heleen is from South Africa. Gosh, blogging makes the world a bit smaller, doesn't it? No borders in bloggy world and it's so easy to reach out and touch! How cool is that? Heleen shares her story of overcoming bulemia and compulsive overeating. She is so overjoyed that she wants to share her story with others. So, don't miss out and get on over there now. I'm adding one more link to my Fitness Friday post. My good friend Lisa Shaw has posted an excellent 2 minute vlog that you won't want to miss. She speaks about fitness but also about how women view themselves. No more put downs; you are God's precious child. So, take the time to listen to Lisa, please. aaaahhhhh ouch!!! I'm the excuses queen! Debbie, awesome post!!! I love Leslie Sansone and I agree with you on the American Heart Assoc. I stand in agreement with your entire post. I'm going to update my link to add yours in. Love you. Ah - the thought of being able to walk again! lol. I don't know how I'm going to last the summer sitting down all the time - I'm in my third trimester and I can't walk without support now (my pelvis is complete sponge and so I have no strength to hold myself up). Its probably for the best though - I'm starting to get water retention even when sitting down - hate to think how bad it could get if I could walk. The joys of pregnancy...lol. But you know - I can't wait to get back into walking. I think it should be a part of every exercise regime. I'll be sure to follow those links so I can make the most of me minus one baby...lol. I love Leslie, have several of her dvds. Wonderful post! I love to exercise! It just makes me feel so good afterwards. But I am one of those people who have to leave the house as I tend to get distracted if I don't. You know, kids! LOL. I'm going to go check out the vlog now! Such good advice, Debbie. I like all the suggestions you made. Does this count ... I took 7 boys out to the ball fields this morning for baseball drills and practice for about 2 hours. SW Kansas is gettng hot, so I'm going to count it! Yes...walk, walk, walk!!! It's my favorite exercise. Great post! I loved the stop sign. 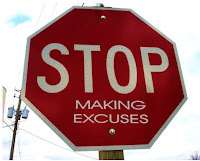 I don't tend to make too many excuses. I tend to be on the other end. I've had a pulled quad for the last 3 weeks and still have been working out... no wonder it's not healing! Months ago I was sick with a high fever and strep throat... I still worked out. I am one to not give my body the proper rest and recover time that it needs. I think I need to see reality and actually use my "excuse" for my strained quad muscle! I enjoy the Leslie Sansone exercise DVD's for when I can't make it outside. But now I better go out and get fresh air and a walk. It is so easy to put it off with all the other responsibilities we have. Thanks for the reminder. I need to check out the exercise on demand. I do love to walk I just have to quit exercising my elbow that takes my hand right to my mouth. I need strength, I was telling Lisa and I have noticed subcutaneous fat on my abdomen, it that from age it seem to just appear and I am going to start doing some crunches but I have got to have better eating habits.